With spring just around the corner, there are even more reasons to make the most of any early sunshine – to start boosting levels of vitamin D, which are low in many people by the end of the winter. So why is vitamin D so important? How much of this ‘sunshine vitamin’ do we need to stay fit and well, and keep our eyes healthy, without raising our odds of developing skin cancer? And how can we safely boost our body’s stores to see us through the year? Vitamin D is a fat-soluble vitamin which is stored in the body. It is well known for its role in building and maintaining healthy bones and teeth. That’s because vitamin D helps the body to absorb and use calcium and phosphorus. This essential nutrient also promotes healthy muscle function and helps keep the immune system healthy . On top of this, vitamin D may have many other vital roles in the body, with new and exciting research suggesting it may help protect against some cancers, diabetes, heart disease, age-related macular degeneration (AMD) and even cognitive decline . Dubbed the 'sunshine vitamin’ because around 90% of the vitamin D we get is made when the skin is exposed to ultraviolet B rays (UVB) from sunlight during the months of April and September - not from food. “Outside these months, UK sunshine does not provide enough UVB rays needed to make significant amounts of vitamin D in the skin – even if it is a sunny day,” says Professor Adrian Martineau, an authority on vitamin D at Barts and the London School of Medicine and Dentistry. For years, public health advice has been to stay out of the sun and to wear sunscreen to cut the risk of getting skin cancer, and to protect against premature ageing – and for good reason. However, if we also spend most of our time working or playing indoors during the summer daylight hours, our skin won’t be exposed to the stronger UVB rays that are needed to make vitamin D either, with the result we may not make enough to stay healthy all year round . So just how much summer sun do we need to top up our stores of vitamin D? What’s important is getting the right balance. “Sun exposure is a major source of vitamin D”, says Johnathan Major of the British Association of Dermatologists. “But, when excessive, it is known to be the main cause of both melanoma and non-melanoma skin cancers, which continue to escalate in number in the UK.” There is no ‘one size fits all’ recommendation on the precise level of sun exposure that will safely provide us with enough vitamin D, as there are so many variables - our personal skin type, where we live, time of day, weather conditions, and more. NHS Choices advises that exposing hands and face for about 15 minutes a few times a week during spring and summer is sufficient – taking care not to burn . Indeed, you do not have to sunbathe to make vitamin D ! The latest National Diet and Nutrition Survey (NDNS) confirms that around 39% of 19 to 64 year olds and 29% of adults aged 65 years and older potentially have insufficient levels of vitamin D circulating in their blood during the winter months . In adults, it can lead to called osteomalacia, a painful bone-softening condition that can hamper mobility [2,4]. When it comes to your eye health, while it is important to be aware of the impact the sun has on your eyesight, exposure to UV rays can lead to both cataracts and AMD (the leading cause of sight loss in the over 60s, it leads to a loss of central vision). High blood vitamin D levels have been shown to be protective against AMD, whereas low vitamin D levels have been associated with late AMD. How can we eat more vitamin D? 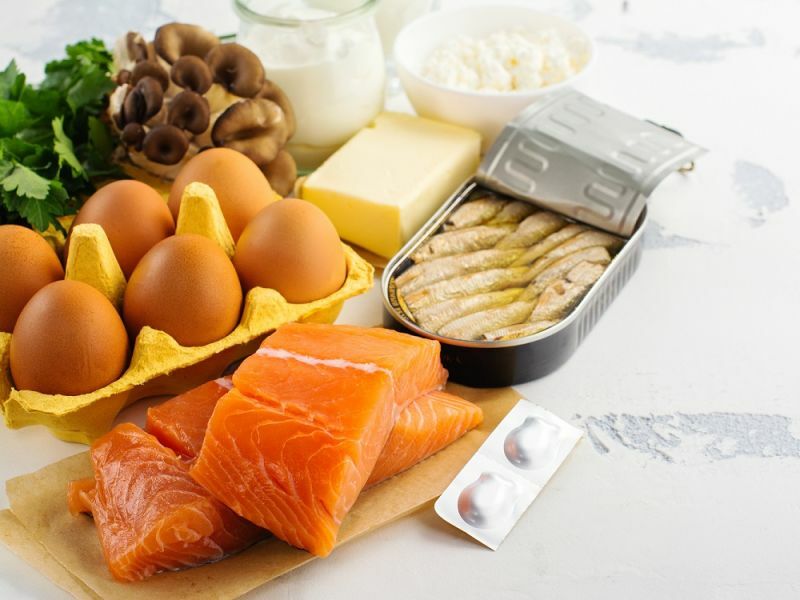 There are only a few foods that naturally contain any vitamin D [10,11], including oily fish such as salmon, fresh tuna, mackerel and sardines, egg yolks, offal (kidney, liver), wild mushrooms, milk and dairy products. Some breakfast cereals, fresh fruit juices and yogurts are also fortified with vitamin D, and although no longer a legal requirement, most margarines and fats spreads are still voluntarily fortified with vitamin D . The NDNS reveals that adults only get around 3 micrograms (μg) a day on average from food . What’s new about vitamin D? In addressing concerns about the UK’s low vitamin D levels and its impact on health, the government's independent advisors, the Scientific Advisory Committee on Nutrition (SACN) is now recommending in its final report on ‘Vitamin D and health’ , that individuals living in the UK consider taking a daily supplement of 10 μg of vitamin D during the autumn and winter months. This is because it is hard to get enough foods that naturally contain vitamin D and/or fortified foods alone during this time of year. While more research is needed to help us reach firm conclusions about the true importance of vitamin D, one thing is certain: with some potentially far-reaching health benefits, it has never been more important to focus our attentions on this vital vitamin and on safely getting enough vitamin D from sunlight, diet and supplements to protect us, all year round. Finglas P.M., Roe M.A., Pinchen H.M., Berry R., Church S.M., Dodhia S.K., Farron-Wilson M & Swan G. (2015) McCance and Widdowson's The Composition of Foods: Seventh Summary edition. Cambridge: The Royal Society of Chemistry. Crawley H., Mills A., Patel S. (1993) Food Portion Sizes (Maff Handbook). Second Edition London. HMSO.